اندازهٔ این پیش‌نمایش: ۵۱۸ × ۶۰۰ پیکسل. کیفیت‌های دیگر: ۲۰۷ × ۲۴۰ پیکسل | ۴۱۵ × ۴۸۰ پیکسل | ۹۴۵ × ۱٬۰۹۴ پیکسل. 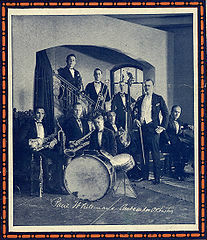 Paul Whiteman and his orchestra in 1921. Whitemans principal arranger Ferde Grofé is seated at the piano to the right. Photo from sheet music cover in the collection of Fredrik Tersmeden (Lund, Sweden).